If you’ve ever gotten a targeted ad from an application on your iOS device, or even on your Apple TV, it’s because ad tracking on your device kept an eye on your activity and tastes and used it to try to sell you something. This potential privacy infringement is less prevalent on the full version of OS X, and if you do most of your browsing on a MacBook or an iMac, you don’t have to worry much about ad tracking. However, if you use iTunes, Apple will still track your listening habits and your browsing activity on the store, at least until they are told not to. Use the steps below to tell them not to. If it isn’t open already, launch iTunes. 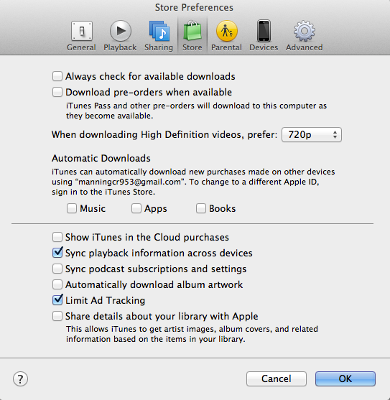 To turn off iTunes tracking, you will also have to log into your Apple ID account. To do this, go to the iTunes Store, select “Account” from the right-hand side of the screen, and enter your Apple ID and password. Select the iTunes menu from the bar at the top of your screen, and choose “Preferences.” A new menu will open where you can edit parental controls, sharing preferences, and other settings. Choose the “Store” tab from the menu—it’s right in the middle with a green shopping bag on it—and look for the “Limit Ad Tracking” checkbox near the bottom of the window. Click the box to activate the function. Just like that, iTunes will no longer use tracking information to provide you with targeted advertisements. If you just want to listen to your music and sync your devices without having to worry about your privacy, the above steps will be able to give you protection and peace of mind. Is there an "ad blocker" that don't track your browsing history, or other privacy issues?